Systemic issues with independent E+P's continue to mount. Only a strong and fast breakout of crude oil to the upside saves many in the sector from a capitalization and debt disaster. Even among the best of the independents, value is tough to find here. In my last article, I outlined my revised outlook for independent US shale producers, in light of the fairly pathetic 4Q 2018 reports that rolled in – this, in light of the strong oil price realizations from the last quarter of 2018 in the low $60 a barrel range. I warned that 1Q 2019 realizations would be at least $10 lower and more likely $15 lower, making all the problems of independent frackers even more stark as we moved through the spring, especially if oil prices did not break out significantly above WTI $60 a barrel. The days of easy money, in the form of private equity investment or equity or bond issuance, seem completely over. Investors have clearly drawn a line on enthusiastic investment for future results – they want to see returns NOW. The appetite to be long futures in the oil markets has been stalling since the mini-crash from October-December 2018 first wiped out 30% of long positions. We’ve seen those positions slowly get reestablished until last week, when it again seemed to stall. Lots of hopeful talk on efficiency gains over the last 2 years from producers still hasn’t translated into strong free cash flow or profits in most cases. Further, new reports are that aggressive lateral spacing, another highly touted tech advancement has been boosting initial production volumes, but eats at total volumes and might even infect sister wells negatively. Oil rallies significantly in 2019, breaking $60 WTI very soon and heading directly for $100 in early 2020. In this case, your highest beta names in the space are the place to be. You'll make 3x on your investment, easy. Oil plays a waiting game, remains generally in balance for 2019 and rallies less significantly, if at all. Perhaps after some consolidation and a significant drop in US production it begins to make a more constructive move, heading towards $100 in early 2021, just in time for the Saudi Aramco IPO. In this case, the majors hold value, deliver alpha and dividends and we still have the option of jumping on the bandwagon of select independent shale players with better timing. 3. Oil prices are stuck: The shale producers refuse to let up on production increases, the Saudis can't make the cuts stick, the China/US trade war drags on, Trump wins the tweet wars and maybe even the US economy goes into recession. 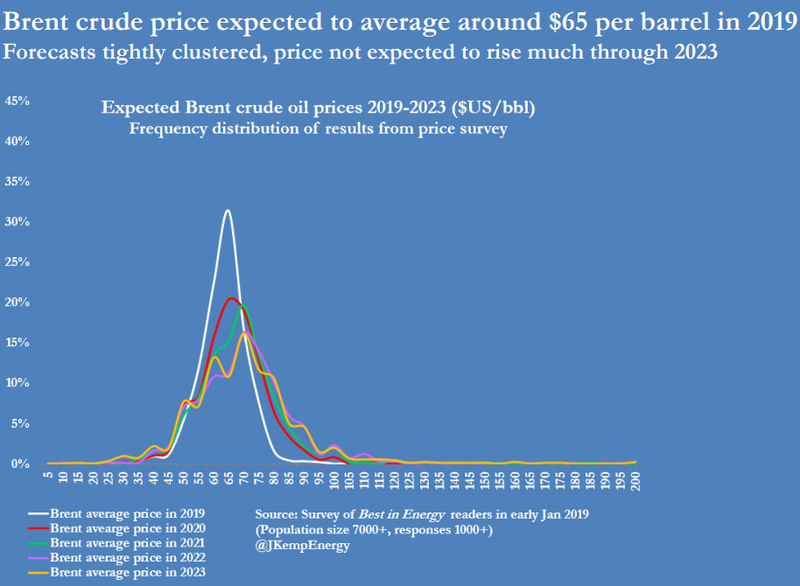 In this case, oil sits between $45-$65 for the next two years, several high beta names go bankrupt while share prices for midcap shale players don't fare well either. Majors, however, retain far more of their value due to better capitalization and 4-6% dividends. I am a fundamental believer in $100 oil and expect to see it again, probably as early as late 2020. However, my caveat is that oil does not rally fast enough to create value for several in the sector. EOG is generally regarded as one of the best of breed in the space, including by me. Yet here, even after two years of their superior acreage, premium drilling program and disciplined spending and growth, they are projecting reasonable cash flows only above $60 a barrel, and more like $65. Imagine if higher crude prices are still this critical to EOG, how delicate the balance likely is for other, lesser E+P’s in the space. 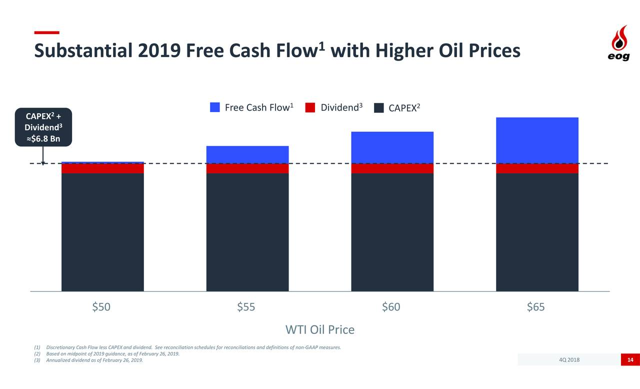 Continental Resources (CLR): There is sufficient free cash flow here, and even with their lowering of capex, they are promising to marginally grow production in 2019. In my view, they still have the best position in the Bakken. Occidental Petroleum (OXY): Fantastic looking Permian acreage, good FCF, and they reported a profit of $700m on $4.8b of revenues. In addition, their 4% dividend looks solid. Despite all this, they are jettisoning assets to keep the cash coming in, so you’d still need to wonder a bit about their anxieties going into the next two years. Concho Resources (CXO): Losses in their last report were mostly attributable to hedging writedowns, a mistake that won’t likely happen again. Just barely turning the corner in FCF, it might be the only marginally high beta play I’d bless here. 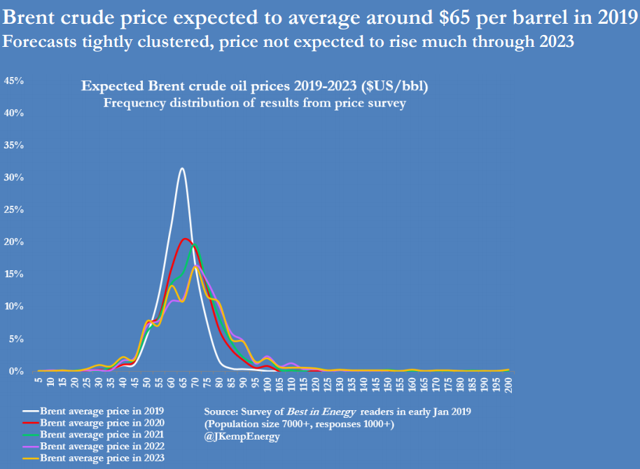 EOG Resources (EOG): Their premium drilling program is clearly paying off, but as I said, they STILL need $60 crude to marginally generate cash – if EOG is this tight, imagine what the rest of the group looks like. Hess (HES): It went too low on the last mini-crash and then rebounded too strongly. The opportunity was then in my view, not now. There is some FCF, but considering the moves they made over the last several years, jettisoning their trading arm and concentrating on the Bakken, the report should have been better. In all, I like them, they are a relatively good one, but at $59 they are too expensive for me. And then there's Exxon (XOM) : OF COURSE. All the talk has been about their aggressive new plans with their Permian acreage acquired more than two years ago for a hefty $6.6b, but I’ll have a lot more to say about them in a separate article. What hasn’t been discussed much is their massive 165% add of reserves reported in 4Q 2018, which prior to this was the biggest knock on them for the last 3 years. Cash, dividends, a coming resumption of buybacks – Exxon has it all. The question for the future is whether majors like Exxon will have better success in generating free cash flow and profits from the Permian than the independents have had to date. But again, that is a question for another article. Thank you for reading. Please keep in mind that these thoughts are gathered from presentations I made nearly three weeks ago and may be less timely today. Disclosure: I am/we are long EOG, XOM. I wrote this article myself, and it expresses my own opinions. I am not receiving compensation for it (other than from Seeking Alpha). I have no business relationship with any company whose stock is mentioned in this article.